What do a Technology Project Manager, a Business Graduate, and a Trucker have in common? The same starting salary when they come out of school. “Students can start making $52,000 a year as beginners,” says one instructor who has graduated countless truckers from EZ Wheels Driving School. According to the latest salary figures published Money Magazine, that $52,000 figure beats the average starting salary among all new college graduates: $45,478. The numbers are even more impressive when you consider what the median annual salary for a High School graduate is according to the U.S. Bureau of Labor Statistics: $33,176. Jose P. came to the USA at 22, eager to pursue the American Dream. But going to college with no money and broken English was no option. Being a trucker sounded like an exciting way to get to know his new country, so Jose saved up $3000 to attend EZ Wheels Trucking School. “I was working 12 hours a day at a factory, and I knew I wanted a better life,” he says. In three months, Jose had his Class C Commercial Driving License and was driving tractor-trailers cross-country, making the kind of money that would let him buy his first home and provide for his mother. Gaining more experience over the years has only meant making more money. “I earn in one week what it used to take me a month,” says Jose, whose trucking career allowed him to make good money AND improve his English on the road, all the while supporting his growing family and fulfilling his American Dream and seeing America from sea to shining sea. “I couldn’t be happier with my decision to drive for a living,” he says. 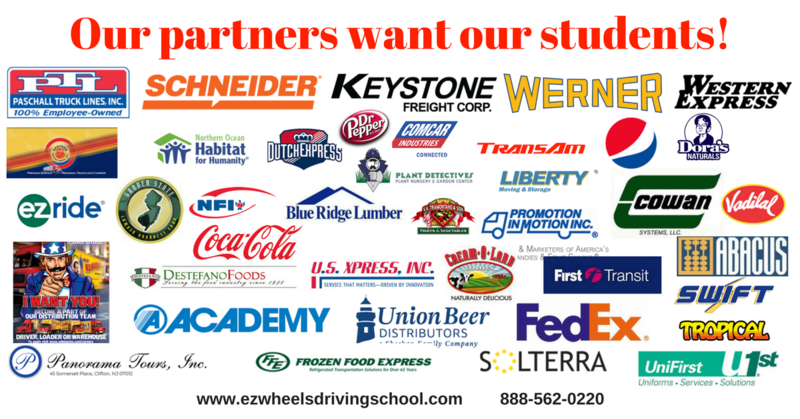 If anyone understands the great advantages of a trucking career, it’s EZ Wheels’ own instructors, who have experience as truckers themselves.